“I support the government, but there are policies I don’t like” is an often heard caveat. No government attracts uncritical support, especially one elected to govern a nation of hyper-judgmental, compulsive nit-pickers. We are quicker to criticise than praise. But the SNP have a lot of implemented policies to chose from, if you don’t like the ones they espouse. As we approach an election in which the SNP’s opponents are doing their devious best to convince us a vote for the SNP is wasted, and both votes for the SNP is a crass misuse of democracy, I thought it only fair to reproduce their achievements since they took office. Scotiaphobes will dismiss the lot. But there’s one thing they can’t deny: the SNP altered Scottish political life and discourse in a profound way – for the first time in 300 years we are empowered as individuals. Our voice matters. We’re heard, and not treated as a herd. Lists are tedious; so they’re lumped into categories: you can pick an’ mix. Record health funding – over £13 billion in 2017, £3.6 billion more than when we took office. Free, high quality childcare has been increased to 16 hours a week for all 3 and 4 year old’s – up from 12.5 hours in 2007 – and extended to 2 year olds from low income households, saving families up to £2,500 per child per year in total. More people in employment in Scotland than the pre-recession high point, outperforming the UK on female employment and inactivity rates. Higher exam passes up by a third since 2007, and we’re investing record amounts in schools to close the attainment gap. £120 million will go direct to schools this year alone. We exceeded our world-leading target to reduce emissions by 42 per cent by 2020 – six years early. 1.3 million older and disabled people benefit from free public transport through the National Concessionary Bus Travel Scheme – now extended to help disabled veterans. Target to build 30,000 affordable homes exceeded, with an investment of £1.7 billion. Free tuition protected, saving students in Scotland up to £27,000 compared to the cost of studying in England. To help protect jobs and businesses through the recession, we’ve slashed or abolished business rates for 100,000 premises – saving small businesses £1.2 billion to date. 78,000 elderly benefit from access to a wide range of personal care without charge. Recorded crime in Scotland has reached its lowest level in 42 years. Prescription charges abolished. In England, patients are forced to pay £8.40 per item. Road Equivalent Tariff rolled out to all ferry routes in the Clyde and Hebrides, cutting fares by around 40%. 178,000 low income households helped to buy essentials such as nappies, food and cookers through our Scottish Welfare Fund since it was established in 2013. By keeping Scottish Water in public hands customers pay less for a better service – charges for the average household bill are £39 lower than in England and Wales. We’ve kept Council Tax down. Bills are lower in Scotland than in England – by between £300 and £400. We’re leading the way on fair pay. Scotland has the highest proportion of employees in the UK paid at least the Living Wage. Scotland, with one of the most progressive equal marriage laws in the world, has been rated the best country in Europe for LGBTI equality and human rights for the second year running. The number of nurses, doctors and dentists working in Scotland’s NHS has increased. Staffing is at record high levels, up more than 11,500 in the last ten years. Patient satisfaction continues to increase with 90 per cent of NHS Scotland patients rating their care and treatment as good or excellent. Scotland’s A&E services are the best performing in the UK. 95% of hospital day case and inpatients seen within 12 weeks last year. Healthcare kept local. A&E units saved, children’s cancer services and neurosurgery units protected, and maternity units kept open. Over £5 billion has been invested in Scotland’s health infrastructure since 2007, including the South Glasgow Hospitals and Emergency Care Centre in Aberdeen. We’ve kept healthcare local. That means A&E units have been saved, children’s cancer services and neurosurgery units protected, and maternity units kept open. We’re supporting the lowest paid workers in our NHS by delivering the real Living Wage. Entry level pay for NHS support staff, Band 1, in Scotland is £881 higher than England, and over £1,300 higher than Northern Ireland. Nurses in Scotland are better paid than anywhere else in the UK. A nurse in Scotland, at Band 5, is paid between £225 and £309 more than their English counterparts. Our hospitals are cleaner and safer. In over 65s cases of C.Diff are down 86 per cent, and cases of M.R.S.A. are down 93 per cent. Almost £40 million has been invested to raise public awareness of cancer, and catch it sooner, driving earlier diagnosis in a range of cancers. The risk from cervical cancer for the next generation of young women has been cut by providing the HPV vaccine for girls in second year of secondary school. Scrapped parking charges at NHS-run hospital. Patients and staff save £27 million. Highest number of G.P.s per head of the population in the UK; more practices are now open in the evenings and at weekends. Scotland was the first country in the UK to have a mental health waiting times target, and spending on mental health services in Scotland will exceed £1 billion for the first time in 2017-18. 98% of primary and secondary schools providing two hours of physical education a week – up from 10 per cent in 2005. More funding than ever before is being provided to support carers and young carers, with investment of over £122 million in a range of programmes since 2007. Irresponsible alcohol discounts in supermarkets and off-licences banned. Legal age for buying tobacco raised to 18. Everyone who uses social care services can now control their individual care budget through the Self-directed Support Act. Extra funding for Scotland’s veteran charities, ex-service men and women receive priority treatment in the NHS and other services. We have brought forward plans for a £5 million expansion of the Golden Jubilee Hospital – the first part of our plan to invest £200 million in a network of elective and diagnostic treatment centres to help meet the needs of an ageing population. We’re recruiting more G.P.s by increasing the number of training places from 300 to 400 each year. We’re training more paramedics, with a commitment to train 1,000 more by the end of this Scottish Parliament term. IVF is being expanded to more families – making access in Scotland the fairest and most generous in the UK. We’ve banned smoking in any vehicle carrying anyone under 18. All children in primaries 1 to 3 – around 135,000 pupils – benefiting from free school meals, saving families around £380 per child per year. We have launched the Scottish Attainment Challenge, and investment in that programme will be £750 million over the life of this Parliament. Total revenue spending on schools has risen by at least £220 million since 2006-07, and spending per pupil is higher in Scotland than England. More school pupils are now in well-designed, accessible and inclusive learning environments. Between 2007 and 2015, 607 schools were built or refurbished – twice as many as the previous Labour/Lib Dem administrations. Since the introduction of the Gaelic Schools Capital Fund in 2008, the number of young people in Gaelic Medium Education has increased nationally by 32 per cent. The Disabled Students Allowance has been protected and bursaries for students have been maintained in Scotland, while the Tories have abolished both elsewhere in the UK. We’ve expanded the Education Maintenance Allowance in Scotland – now scrapped south of the border – to support even more school pupils and college students from low income families. Over 117,000 full-time equivalent Scottish Government-funded college places are now being provided – exceeding our 2011 manifesto commitment to maintain 116,000 places. We have invested over £550 million in college estates between 2007 and 2015, £250 million more than the previous Labour/Lib Dem administrations.Full-time college students in Scotland can now benefit from the highest bursary of anywhere in the UK. A record number of Scots have been supported into university, and young people from the most deprived areas are now more likely to study at university. The poorest university students who are living at home are benefiting from a minimum income guarantee of £7,625 per year – the highest in the UK. Since 2007, the number of female entrants in STEM subjects at Scottish universities has increased by 26 per cent in first degree courses and 47 per cent in postgraduate courses. The percentage of pupils leaving school with at least one Higher level or equivalent qualification has increased by almost 45 per cent under the SNP. The First Minister’s Reading Challenge, which aims to encourage children to read for pleasure, has been opened to all primary school pupils after the success of the initial scheme for primaries 4 to 7. We’re supporting a further £300 million of investment to deliver new campuses at City of Glasgow, Inverness and Ayrshire Colleges. And Forth Valley and Fife Colleges will share £140 million for new campuses too. We’re providing our further education students with record levels of support of £106 million – up 34 per cent under the SNP. The number of full-time college students completing recognised higher education qualifications is at an all time high. The number of graduates from Scottish universities going into work or further study is among the highest in the UK. Graduates from Scottish universities are earning more than their counterparts in other UK nations. Youth unemployment has hit its lowest rate since records began, and is the second lowest in the EU. Today Scotland has the highest pay anywhere in the UK outside of London and the South East. Productivity growth in Scotland is four times as fast as the UK – as measured by output per hour worked. Since the SNP came to office, productivity has increased by 9.4 per cent, while stagnating for the UK as a whole. Around 200,000 young people have had the opportunity to undertake a Modern Apprenticeship since 2007. And by 2020, a further 30,000 opportunities will be available every year. Around 20,000 families supported to buy their own home through home ownership schemes – three quarters of them under the age of 35. Councils have been enabled to build new homes for the first time in years – with 7,169 new council homes delivered. 15,500 social houses for rent have been safeguarded by ending Right to Buy. We’re taking action to stimulate Scotland’s economy following the result of the EU referendum. This includes bringing forward £100 million of government spending on infrastructure, and a £500 million Scottish Growth Scheme to support businesses – particularly start-up companies – with the potential to grow and export more. £500 million invested to stimulate economic growth in Glasgow and the Clyde Valley. £125 million has been allocated through the Aberdeen City Region Deal to stimulate and support economic growth in the city, alongside an additional £254 million for infrastructure projects in the North-east. £60 million put towards a Town Centre Regeneration Fund. By the end of 2021 we will have committed £1 billion to tackling fuel poverty, and over one million energy efficiency measures have already been installed in almost one million households across Scotland. Tax burden reduced on the sale of homes, with 93% of house buyers paying less than under UK stamp duty land tax or paying no tax at all. The number of registered businesses in Scotland has reached 173,995, the highest number on record. Scotland’s international exports – valued at £28.7 billion in 2015 – are up 41 per cent under the SNP. Scotland’s tourism industry is going from strength to strength – with 14 million tourists visiting Scotland in 2015. Enterprise and development spending per head in Scotland is almost double that of the UK. Scotland is the top destination, outside of London, for foreign direct investment. Scotland has the highest house-building rate in the UK. Since 2007, we have built 41,000 more homes than if we’d matched the lower rate in England – that’s the equivalent of a new town the size of Paisley. We are investing £135 million in the Inverness and Highland City Region Deal – two and a half times the UK Government investment. We’ve helped people into home-ownership through the Land and Buildings Transaction Tax, which has lifted 15,000 households out of tax compared to Stamp Duty in the rest of the UK. Public sector procurement has been simplified, with more small and medium-sized enterprises now competing for and winning public sector contracts. We won new powers over tax and social security, and protected Scotland’s budget from a £7 billion cut by the Treasury over the financial arrangements enabling new powers. In 2011, we became the first government in the UK to pay the Living Wage to our staff. Poverty levels down. 260,000 fewer people in poverty in 2014 than in 2000. Over half a million vulnerable households in Scotland – including around 190,000 pensioners and over 80,000 single parents – have been protected from UK Government cuts to Council Tax benefit. We have already safeguarded the rights of 2,800 of the most severely disabled by establishing the Scottish Independent Living Fund. Over 200 companies signed the Scottish Business Pledge to boost productivity and increase diversity. Number of days lost to industrial disputes down 84%, the lowest of any UK country. Encouraging public, third, private sector companies to boardroom gender equality. 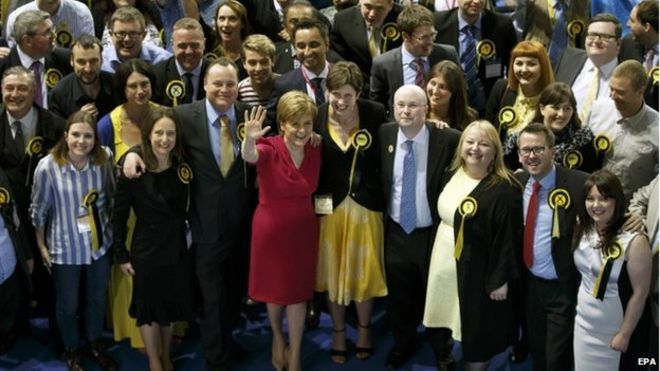 Nicola Sturgeon appointed first cabinet with an equal number of women and men. Scotland is leading light on LGBTI equality, with progressive equal marriage laws. Over £75 million has been spent since 2007 to help some of the world’s poorest and most vulnerable people. From summer 2017, all babies in Scotland are to be provided with a Nordic-style ‘baby box’ in a bid to reduce infant mortality and help families at the start of a child’s life. Over 230,000 low income households in crisis have been helped to buy essentials such as nappies, food and cookers through our Scottish Welfare Fund since it was established in 2013. 1.3 million older and disabled people have benefited from free public transport through the National Concessionary Bus Travel Scheme. Around 77,000 older people in Scotland benefit from access to a wide range of personal care tasks without being charged. We have introduced a Child Poverty Bill which will set targets to end child poverty by 2030, and established a new £29 million fund to tackle poverty at a grass roots level. We’ve kept Scottish Water in public hands. Customers are now paying less for a better service – charges for the average household bill in Scotland are £38 lower than in England and Wales. Our new employment support programmes will be on a voluntary basis and will not interact with the UK government’s punitive benefit sanctions system. Over 300 companies have signed the Scottish Business Pledge – a voluntary code for companies to commit to policies that boost productivity, recognise fairness and increase diversity. We are piloting a Returners programme to help women who have had career breaks back into the workplace. We are leading a 50:50 campaign to encourage public, third and private sector companies to commit to boardroom gender equality by 2020. We now have Scotland’s first cabinet with an equal number of women and men. We have launched a £300,000 Sports Equality Fund with the aim of increasing women’s engagement in sport. Since we took office, violent crime is down by 52 per cent, homicides are down by 52 per cent and handling offensive weapons is down by 69 per cent. £216 million invested in the creation of the new national police service. The new Scottish Crime Campus provides a focal point for excellence in intelligence-sharing, evidence gathering and forensic science to tackle serious organised crime. Since 2007, 1,000 more police officers keeping our communities safe. By contrast, police numbers south of the border have fallen to their lowest level in 15 years. Automatic early release has been ended, meaning that long-term prisoners who pose an unacceptable risk to public safety will serve their sentence in full. The reconviction rate has been reduced to its lowest level in 17 years, thanks to tough community sentences. £75 million has been seized from criminals and has been reinvested in community projects for young people across Scotland. HMP Grampian opened in March 2014 and HMP Low Moss opened in March 2012, two major parts of the prison building programme. Access to air weapons has been tightened to improve public safety. A record £33 million invested to tackle domestic violence against women and girls. Access to justice for survivors of domestic abuse improved too. Tackling sectarianism backed up with record investment. The new Scottish Fire and Rescue Service has been created. Scotland has the UK’s first national action plan on human rights, showing our ambition to be an example of how to realise human rights and tackle injustice at home and abroad. We’re investing £1 billion annually in public and sustainable transport to encourage people out of cars. Commuters have saved around £2,000 since bridge tolls on the Forth Road Bridge and Tay Bridge were scrapped by the SNP. The Borders Railway, the longest new domestic railway to be built in Britain in over 100 years, has reopened and welcomed over 1 million passengers in its first year. £742 million Edinburgh-Glasgow rail improvements; widespread electrification of the network between the two cities, and to Stirling and Dunblane. £3 billion to dual 80 miles of carriageway on the A9 Perth-Inverness, £745 million for the Aberdeen Western Peripheral Route, plus M8, M73 and M74 motorway improvements. £170 million Aberdeen Inverness rail upgrade; new stations at Dalcross and Kintore. Contracts worth £97 million will protect the 150-strong workforce and create 100 new jobs at the last commercial shipyard on the Clyde. Prestwick Airport saved from closure, safeguarding around 1,350 jobs. £500 million a year to deliver higher water quality, better environmental protection, and better service for customers. Scottish Water now UK’s most trusted utility. £400 million to deliver superfast broadband to 95 per cent of properties across Scotland by the end of 2017. We have invested twice as much per head in the rail network in Scotland than the UK Government – £7 billion in rail since 2007. A £5 billion investment programme in Scotland’s railways up to 2019 will deliver longer, greener trains, new stations, new track upgrades, more seats, and more services. We’ve exceeded the 2016 target to provide broadband access to 85 per cent of premises, and we’ll reach 100 per cent by 2021. 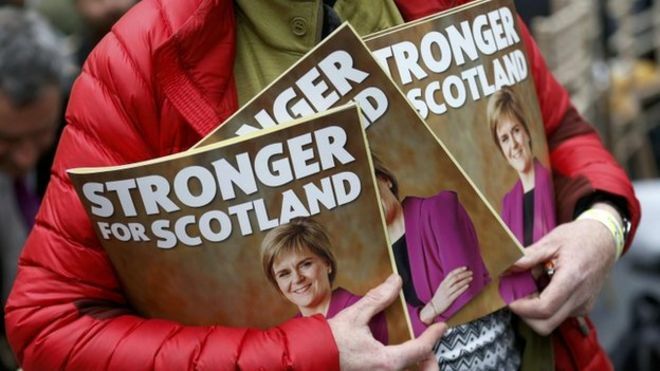 Scotland’s independence referendum was the biggest democratic exercise in Scotland’s history. The voting age for Scottish Parliament and local government elections permanently lowered to 16, starting from May 2016. Local communities have been given a voice in the planning and delivery of local services – backed up by £20 million of funding – through the Community Empowerment Act. The Scottish Land Fund has already helped 52 communities across the country to purchase land, with over 500,000 acres now in community ownership. And the Fund has been increased to £10 million per year. The radical and ambitious Land Reform Act has been passed to transform rules around the ownership, accessibility and benefits of land in Scotland. We’ve launched a £200,000 Access to Politics Fund to help disabled people stand for the 2017 local government elections. And we will continue the fund for the Scottish Parliament elections in 2021. Scotland has exceeded its target to produce 50 per cent of its electricity from renewables by 2015 – with almost 60 per cent of Scotland’s electricity needs met from renewable sources. Our target to reduce energy consumption by 12% by 2020 exceeded, a 13.3% reduction between 2006 and 2013. Scotland is outperforming the UK and all but one of the EU-15 countries in reducing greenhouse gas emissions. We have blocked underground coal gasification and a moratorium means fracking cannot take place in Scotland.Scotland’s household recycling rate was 44.2 per cent in 2015 – up from around 32 per cent for municipal waste in 2007. We’ve helped make our communities safer from flooding with investment in flood defences and new measures in the Flooding Act. And we’ve agreed a new 10 year funding strategy for flood protection, consisting of £42 million a year, aiming to protect 10,000 families across Scotland. Scotland was one of the first countries in the world to sign up to the UN Sustainable Development Goals; established the world’s first Climate Justice Fund. Scotland became the world’s second Fair Trade Nation in 2013. With the support of the SNP Scottish Government, low carbon industries in Scotland and their supply chains generated almost £11 billion for the economy in 2014. Carrier bag use has been reduced by 80 per cent – the equivalent of 650 million bags – in the first year of the carrier bag charge. A record £1 billion has been invested in vessels, ports and ferry services since 2007 as part of our commitment to our islands and remote communities, with six ferries added to CalMac’s fleet and two new ferries due for delivery in 2018. Residents of Caithness and north-west Sutherland, Colonsay, Islay, Jura, Orkney, Shetland and the Western Isles are eligible for a 50% discount on air fares. Created a key role in reforming EU fisheries policy to bring an end to the wasteful discarding of fish at sea. With food and drink exports valued over £4.5 billion and 14,000 new jobs estimated to be created in the sector by 2020, we strive to promote Scotland’s top quality produce. Fares on lifeline ferry services have been frozen for 2017 for passengers, cars and commercial vehicles. The clean, green status of our valuable food and drink sector has been protected by opting out of the cultivation of genetically modified crops in Scotland. Road Equivalent Tariff has been rolled out to all ferry routes in the Clyde and Hebrides network, delivering significantly reduced ferry fares and the highest passenger numbers since 1997. With produce output worth around £2.3 billion a year and around 65,000 people directly employed, we work tirelessly to get the best deal for Scotland’s farmers, crofters and growers. We played a key role in reforming EU fisheries policy to bring an end to the wasteful discarding of fish at sea. Free access maintained to museums and galleries, with 27 million visits to Scotland’s world class national collections since 2007. Government provided support for Scotland to welcome the world in 2014, with the staging of the Ryder Cup at Gleneagles and the Commonwealth Games in Glasgow. £162 million pumped into Scotland’s screen sector since 2007. Over £130 million has been invested in our cultural infrastructure – including the revamped National Museum of Scotland, National Portrait Gallery, and homes for our performing companies including National Theatre of Scotland and The Royal Scottish National Orchestra. More than million £19 million indirect investment in Edinburgh’s major festivals since 2008. £25 million for the Victoria and Albert Museum of Design in Dundee. The new Bannockburn visitor centre which opened in February 2014, and the creation of the Robert Burns Birthplace Museum in Ayrshire which opened in December 2010. 1.5 million opportunities created for young people to take part in youth arts in 2015. Since the SNP government backed the ‘Daily Mile’ challenge 180,000 children in over 1,000 of Scotland’s primary schools now walk or run a mile each day. 98 per cent of primary and secondary schools across Scotland are now providing two hours of physical education a week – up from 10 per cent in 2005. But there’s still much more we want to do. Together, we will continue to shape a fairer, more successful Scotland. Scotland’s budget protected from a £7 billion cut by the UK Treasury over the financial arrangements enabling new powers for our Parliament. Remember this, like P.F.I. contracted schools, no matter how good or bad you think life is in Scotland under whatsoever political party, we do not own our own country for which we pay direct and indirect taxes to the UK Treasury, and soon some taxes to our own Parliament. Ownership comes only when independence is restored. it is a comprehensive list of expenditure,but i dont see any mention of debt,fulsome praise for education but no mention that it is at its worse ever in primary attainment levels,laughable statistics from the police re crime,if its not recorded it cant be counted and on the surface police figures look good but no mention of the thousands of support staff done away with basically all you are doing is listing the things money has been spent on which any party in power could do and as most of that money comes from Westminster how is that to your credit,sorry but like most Scottish politicians you are amateurs playing at it. Where do you think Scotland’s money comes from Mr Koch? You seem to believe Westminster somehow funds the country. Scots pay tax, it ends up in London, London returns some as something they refer to as a ‘grant’, but in reality is a percentage of that sent down in the first place, so a rebate in reality. Scots are pretty fed up paying for vanity projects in London being built. Nothing at all to address the crisis in teaching across Scotland. Who would want to be a teacher ? I guarantee there will be very few votes from teachers come election time. Sad thing is there no alternatives. 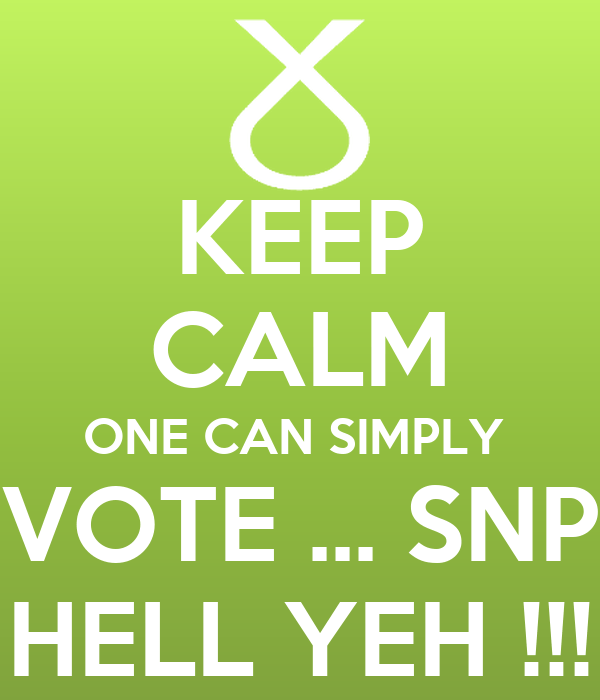 I’m, I’m a teacher and I’m voting SNP. Sweeping generalisations from an unswept mind, I’d say. You say nobody and you mean nobody that matters in your elitist world view. Who died and made you queen? The ratio of pupil to teacher in Scotland is 14/1. In England it is 27/1. One of the first things the SNP government did was set about cutting class sizes. They should probably have abandoned Labour’s Curriculum for Excellence however which produces little result except extra stress on teachers. 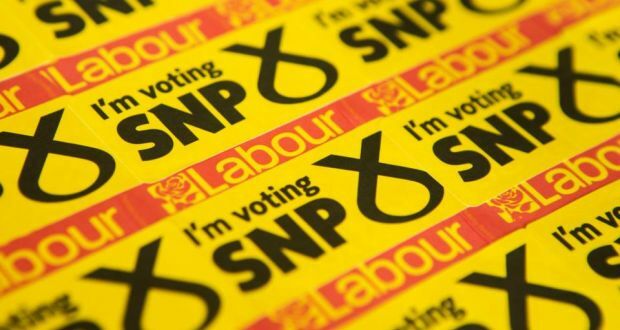 Previous Previous post: The Most Expensive MSP in Holyrood – John Lamont Re-Elected in Ettrick, Roxburgh & Berwickshire – How the Hell did he Do It?